Our Agents - We are looking for good people to join us. If you think you might like a real estate career, either full or part-time, please first click on "Home", then "Careers", then if you feel this describes you, give us a call! Roland Vinyard, the Principal Broker, has over 3 decades of Farm Real Estate experience and for over 2 of these decades also ran his own registered Holstein and crop farm. A graduate of the Universities of Delaware and Connecticut, he is also active in traditional music and the outdoor sports of mountaineering, caving, canoeing and hiking. And he still plays basketball. Peter Hemmerich, is the second generation from his family to work with us. During the day, following a career as a teacher, he works with disabled folks and, when he finds spare time, is an active outdoorsman. 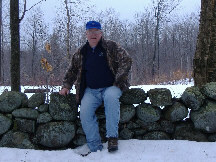 Pete specializes in recreational property found in and around the Southern Adirondacks. Amy Stetson and her husband operate a small grass-fed dairy & diversified farm. She is a Director for the new Richfield Springs food co-op. In addition to farm real estate, she has an interest in commercial real estate. When not farming and selling real estate, along with several other activities, she enjoys time with her grandchildren. 97Larry Casler is a lifelong resident of the Mohawk Valley. He grew up on a family farm, graduated from Cobleskill College, then owned and operated a farm in the Fordsbush area of Fort Plain for 33 years where they raised their family. In 2004, Larry began working as a real estate salesperson. His time is also spent playing on their 40 acre farm, gardening and landscaping, golfing, bowling, and traveling to see the grandchildren. ​Mort spent 50 years with his own real estate license, taking over the original business (begun in 1953) after the death of his father, also named Mort. He was a friend to all, enjoyed a good joke (and some that weren't all that good as well), his grandchildren, good food, tennis and golf. And he wanted to stay in business until the last. He did. We lost a good friend when Mort left. Lee Murdoch (Agent Emeritus) spent a lifetime in the dairy industry, milking up to 150 registered Holsteins and farming over 600 acres and joined us when he contemplated retirement. He hs sold farm real estate for >20 years now.